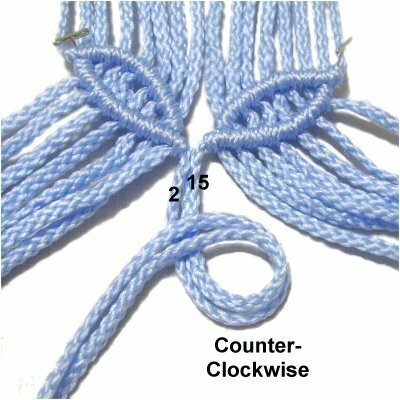 The Daisy Design is a popular Macrame pattern made with Double Half Hitches. Leaves and flowers are frequently found in projects in the early and mid-1900's, so they are considered vintage designs. In the instructions below, the directions show you how to make the DHH curve to form the four petals. 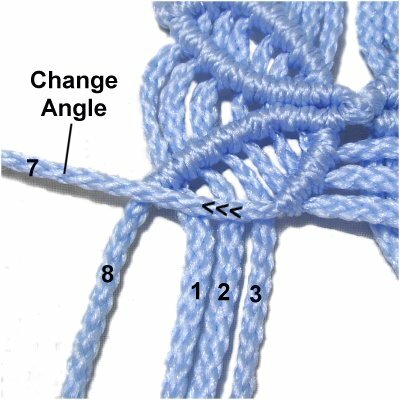 In the center, you can tie a knot as described below, or attach a bead. I recommend you practice horizontal and diagonal Double Half Hitches several times. 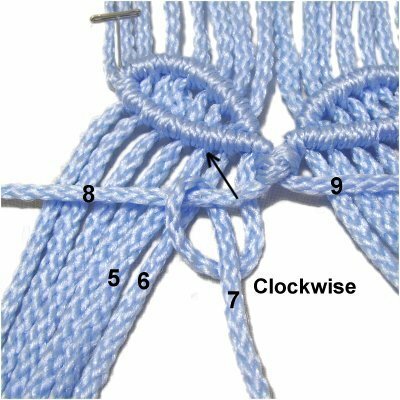 Try to control the holding cord with one hand while tying the knots with the other. Click on the image or link to visit that page. To practice the Daisy Design, cut 8 cords, each 36 inches long. Fold them in half and secure them to your project board with pins. Mentally number the cords 1 - 16. Step 1: Move cord 1 to the right horizontally, resting on top of cords 2 - 8. It should have tension, since it's a holding cord. Attach cords 2 - 4 to it with counter-clockwise Double Half Hitches (DHH). Designer's Tip: It's important to tighten each Half Hitch firmly and evenly, so the petals of the Daisy design are neat. The cords should be straight between the petals and in the secured area. 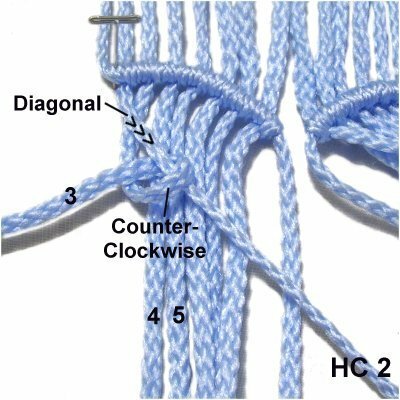 Change the angle of holding cord 1 so that it's diagonal. 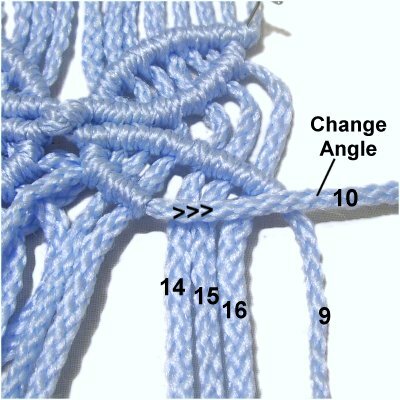 Attach cords 5 - 8 to it with DHH, arranging the knots so they curve. Step 2: Move cord 16 to the left, resting on top of the other cords. It should be horizontal. 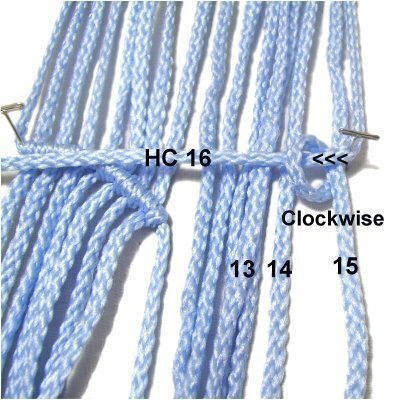 Attach cords 15 - 13 to it with clockwise DHH (in that order). 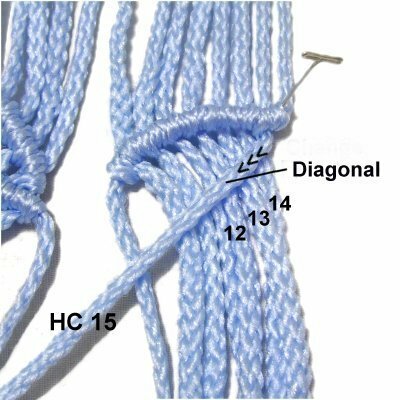 Change the angle of holding cord 16, so it's diagonal. Attach cords 12 - 9 to it with DHH, arranged so they curve. Try to make the curved shape the same on both sides. Step 3: Now you will form the lower portion of the left petal for the Daisy Design. Move cord 2 to the right diagonally. It will be the next holding cord. Attach cords 3 - 6 to it with counter-clockwise DHH. Change the angle of holding cord 2, so it touches the last DHH in the top row. Attach cords 6 - 8, as well as cord 1, with DHH. Make sure the cords remain straight in the area between the two rows. Step 4: To form the lower portion of the right petal for your Daisy Design, move cord 15 to the left diagonally. It will be the holding cord. Attach cords 14 - 12 with clockwise DHH, in that order. 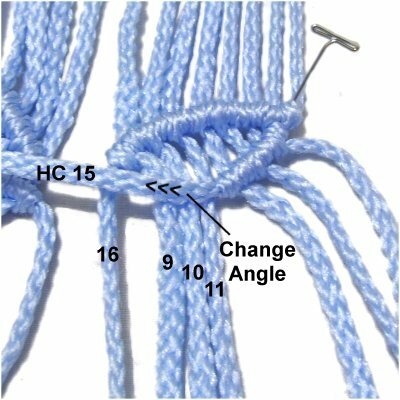 Change the angle of holding cord 15, so it curves towards the last knot in the top row. Attach cords 11 - 9, as well as cord 16, with DHH. Step 5: There needs to be a knot (or small bead) in the center of the Daisy design. 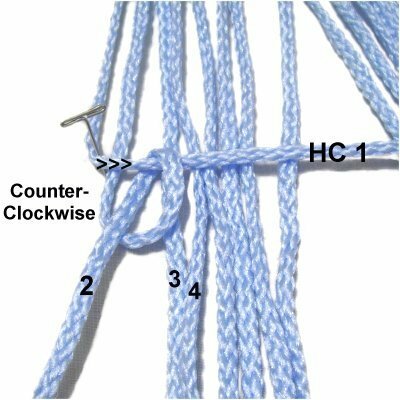 For an Overhand knot, use holding cords 2 and 15 together to make a counter-clockwise loop. 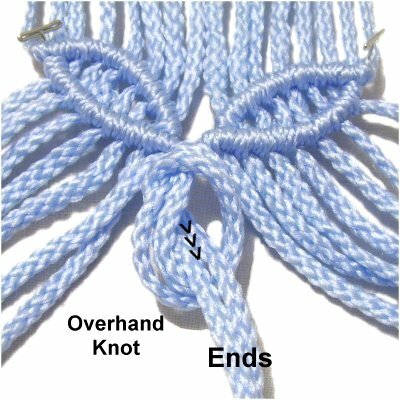 Complete the Overhand Knot by passing the ends through the loop from below, pulling them towards you. Tighten slowly until the knot is firm. 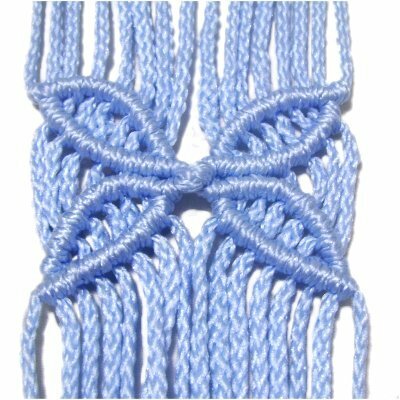 Should you decide to add a bead instead of the knot, pass the cords through in opposite directions. Step 6: Now it's time to make the two lower petals for the Daisy. The direction they are made is different from the first two, since you start in the center and move outward. Mentally re-number the cords. 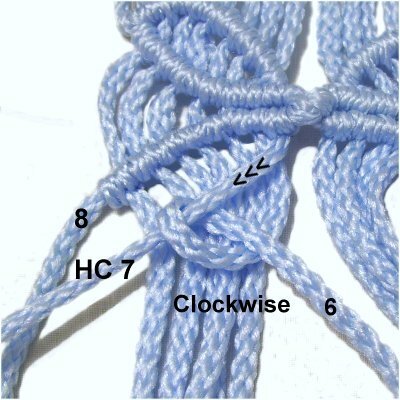 The two cords coming from the Overhand knot should be 8 and 9. Move holding cord 8 to the left. Attach cords 7 - 5 to it with clockwise DHH. 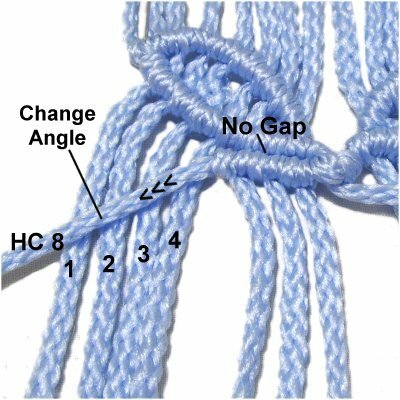 As you tighten each Half Hitch, pull the holding cord towards the previous row, so the DHH rest against the petal above (seen in next image). 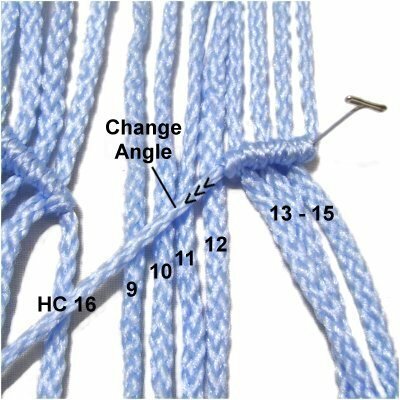 Change the angle of holding cord 8, so it starts out on a diagonal slant. 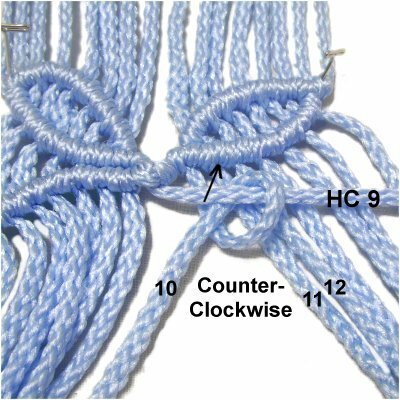 Attach cords 4 - 1 with DHH, curving the knots so they look similar to the ones above. Step 7: Move holding cord 9 to the right. Attach cords 10 - 12 to it with counter-clockwise DHH. 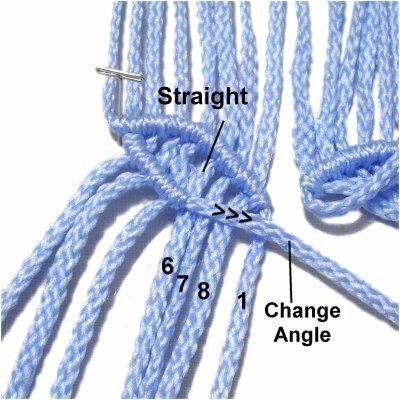 Pull the holding cord towards the previous row when tightening each Half Hitch, so they are close together. 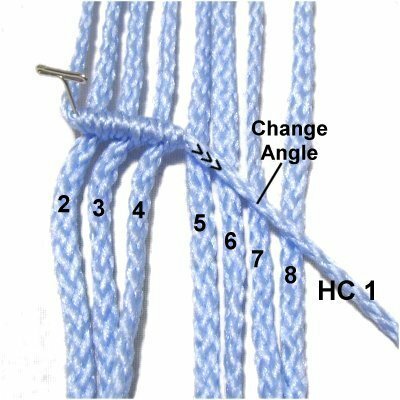 Change the angle of holding cord 9 so it starts out diagonal. Attach cords 13 - 16 to it with DHH, curving the knots like the other petals. Step 8: To make the bottom of the left petal, move cord 7 diagonally, and use it as the holding cord. Attach cords 6 - 4 to it with clockwise DHH, in that order. Change the angle of holding cord 7, so it curves towards the DHH in the top row. Attach cords 3 - 1, as well as cord 8, with DHH. Step 9: To make the bottom of the right petal, move cord 10 diagonally and use it as the next holding cord. Attach cords 11 - 13 to it with counter-clockwise DHH. 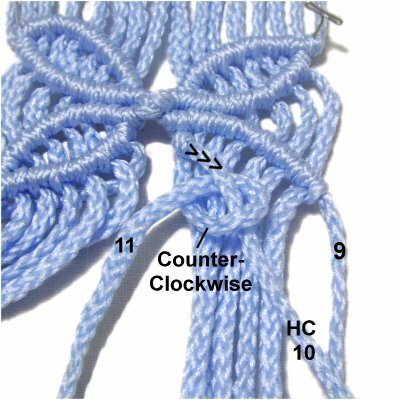 Change the angle of holding cord 10, curving it towards the last DHH in the top row. 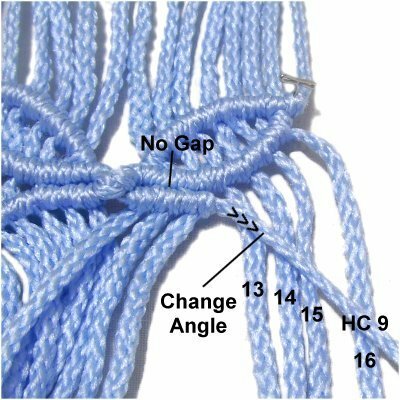 Attach cords 14 - 16, along with cord 9, with DHH. Have any comments about the Blank? Contact Me.